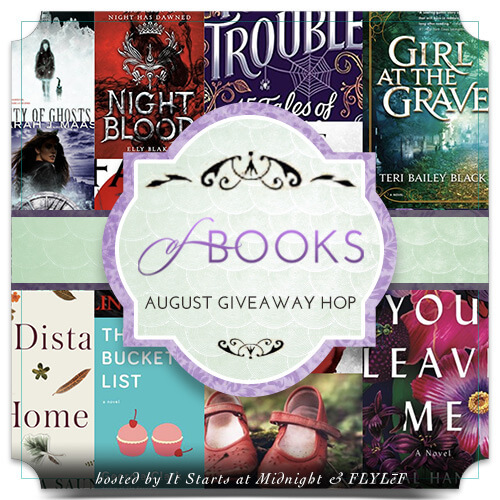 Enter this giveaway for a chance to win books of choice released in August 2018 worth $30. Good luck! I am looking forward to reading Girl at The Grave by Teri Bailey Black. It sounds really good. Seafire by Natalie C. Parker! I'm waiting on Through The Fire by Katie Ruggle. It's the 4th in her Rocaky Mountain K9 series and I love the characters. Magic Triumphs by Ilona Andrews. It's the last book of the series and I have anxiously waited over a year for this! *_* I love Kate Daniels and LOVE Ilona Andrews!! The Governess Game by Tessa Dare. I'm looking forward to a lot of releases this month but Beautiful Exiles by Meg Waite Clayton is definitely one of them. It's about about Martha Gellhorn and Ernest Hemingway. I really love reading books involving famous people (in this case author) from the past. :) Thanks for the chance to win! I'm most excited about Catwoman: Soulstealer because I have yet to read a book by that author but have always meant to. Never that Far because I like clean romances! Catwoman: SoulStealer by Sarah J. Maas! The Good Luck Charm by Helena Hunting because it sounds interesting. A Killer's Mind by Mike Omer. I have loved it from its description. The adult title I'm most looking forward to is Goodbye Paris by Anstey Harris because it's sounds quirky and emotional. The YA title I'm most looking forward to is The Other Side of Lost by Jessi Kirby because I like the idea of a journey through the wilderness. Toucan Keep a Secret by Donna Andrews. Every new book in this long running series feels fresh & is so funny. The August book I'm most looking forward to is Magic Triumphs by Ilona Andrews. It's the wrap-up of the main story arc of one of my favorite series. Let Me List the Ways by Sarah White, it sounds like an interesting ya contemporary read! I can't wait to read These Rebel Waves! i just love Sara's writing! KISS OF DEATH by Paul Finch. He certainly knows how to write a great crime thriller and it will keep you guessing until the very end. "Which August 2018 release are you most looking forward to and why?" "The Masterpiece" by Fiona Davis sounds like an intriguing story of art and Grand Central Terminal! I'm looking forward to enjoying The 104 Storey Treehouse by Andy Griffiths with my nephew. We are big fans of the series. The Girl in the Grave by Teri Bailey Black because I dig that crazy grave. I am looking forward to Stygian by Sherrilyn Kenyon, because I love her Dark Hunter series. The Mystery of Three Quarters by Sophie Hannah. I am a huge fan of Agatha Christie and I love Sophie's book. Girl at The Grave by Teri Bailey Black sounds very interesting. I love thrillers and would like to read An Unwanted Guest! I am wanting to read Girl at The Grave. I read a review of it a few weeks back and it caught my attention and I have had it on my TBR list ever since!! I'm looking forward to Losing the Field by Abbi Glines because this is one of my favorite books series! Catwoman by Sarah J Maas because I love all of her books! Mirage sounds like a book I would enjoy so I will choose that one. Thanks!